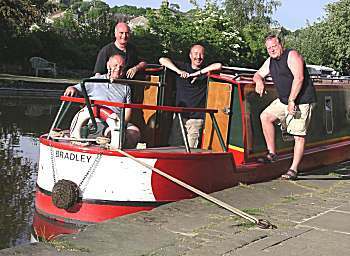 After purchasing sufficient provisions for the trip, the crew headed for the Pennine Cruisers boatyard to board the Narrowboat "Bradley". The crew was given ample instruction on the navigation of the boat by Ray who helped navigate the boat to the first fully automated swing bridge, where Alan took great delight in stopping all the traffic whilst the narrowboat was gently negotiated through the bridge. After several more manual swing bridges, the first of 6 double locks at Gargrave was successfully passed. The crew found the heavy double gated locks much more difficult than on previous holidays and were much troubled. The crew considered in necessary to devour the entire Pork Pie after the exertion of the locks. Jim considered it essential to allow the crew a stop at the Anchor Inn at Gargrave for 1½ pints of Boddingtons (except Jim). Paul made Egg Mayonnaise and tomato sandwiches for all the crew on route, which were much enjoyed. A further 8 locks were negotiated, including the "Bank Newton" flight of 6 locks. Arrived at 7-10pm at East Marton to where the Captain permitted the crew to have an evening drinking and dining at the Cross Keys public house. Copious quantities of Black Sheep ale together with some Butterfish steaks, Ale Pie and Gammon were greatly enjoyed by all members. Two members of the crew succumb to the delights of the Lemon Meringue pie. After a comfortable night on board, an excellent fried breakfast was prepared by Jim & Neil. 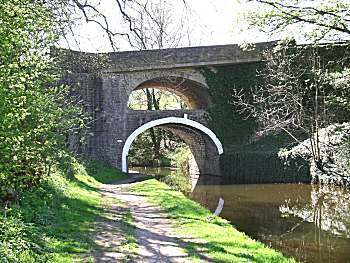 The delights of the Greenberfield locks, just short of Barnoldswick, were enjoyed by all, where Alan pointed out the fact that this was the highest point of the Leeds Liverpool canal and marvelled at the canal water feed from a reservoir some 10 miles away. After stopping for water, we continued on our way past the two Rolls Royce and one Slumberland factory, to arrive at Salterforth in an attempt to locate toothbrush shop for Neil (who had forgotten to pack the item). 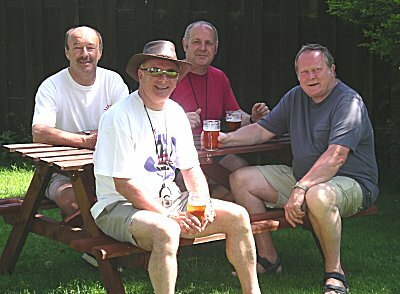 On discovering that the nearest shop was over 15 minutes walk away, Jim considered it necessary for the crew to sample the Deuchers Ale from the Anchor Inn, in the beer garden (see below). The fare at the Anchor Inn was inspected and the crew considered it a reasonable establishment to spend Saturday evening. 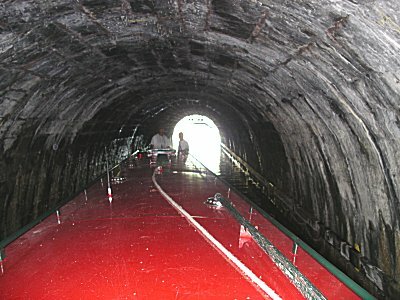 The crew returned to the narrowboat in time to reach the Foulreach Tunnel (1mile long) in time for the 2pm traversing slot, where Paul expertly navigated through the dark and wet tunnel. Waiting for the 2pm tunnel "Slot"
After leaving the tunnel, we passed a suitable winding hole to turn the boat. However, at the insistence of Neil we continued past, as he was confident that there was another just before the Barrowford Locks. 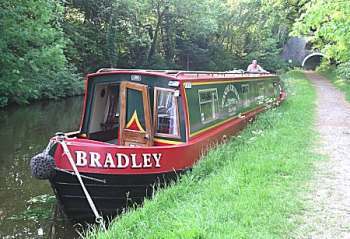 However, his knowledge proved to be unfounded and the crew had to undertake the difficult task of reversing the narrowboat back down the canal past numerous moored boats. This was a dangerous and daring manoeuvre, but completed without any problems by excellent teamwork by the now skilled crew. The task of turning the boat was achieved with Alan at the helm and we were able to moor up for a lunch of ham and tomato sandwiches, with a little football. At 4-15 we departed the moorings to attempt the return journey through the tunnel. 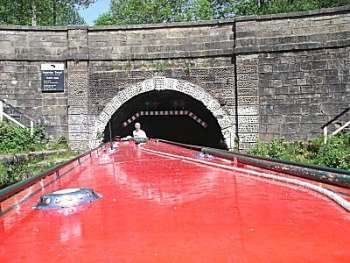 The crew were much perplexed by the absence of traffic light signals at this end of the tunnel, but Neil raced through the tunnel at "break neck" speed to arrive at Foulridge wharf with a hot and complaining engine. After a unsuccessful toothbrush hunt at Foulridge, the crew returned to the boat to continue their epic journey back to Salterford, where we moored for the evening at 6pm close to the Anchor Inn. Jim considered it necessary to go ahead of the other crew to sample the waters, whilst the remainder enjoyed the evening sunshine, before heading down for dinner. Alan found in his washbag a complimentary toothbrush courtesy of American Airlines, which enabled Neil to immediately carry out a thorough tooth cleaning exercise, much to the delight of the remainder of the crew. The crew joined Jim in the Anchor Inn for additional Deuchers ale and some much deserved dinner of Scampy, Ale Pie and Giant Yorkshire pudding. After another comfortable night on board, the crew left their moorings at 7-50 in an attempt to make the long journey all the way back to Skipton. Breakfast was prepared on the move and consumed moored at top lock of the Greenberfield locks, where the crew filled with water and made good use of the facilities provided. Breakfast comprised the remainder of the sausages and bacon, together with scrambled egg and tomato. The three Greenberfield locks were completed in tandem with another narrowboat, after which a long and pleasant journey through East Marton and the meanders before arriving at the Bank Newton flight of six locks. A near catastrophe was narrowly avoided when Jim was attacked by a swan, whilst passing their nest with young. Only the quick thinking of the captain and careful use of the barge pole saved the narrowboat. The crew continued past the Anchor Inn in Gargrave to moor between two locks where they walked into the town to visit the Old Swan public house, where a number of pints of Copper Dragon were consumed together with some excellent sandwiches. 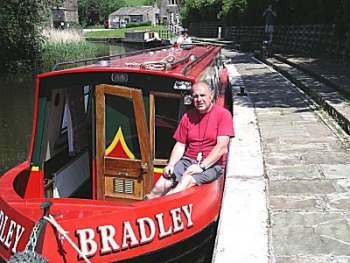 Jim rejoined the boat at the lock to continue through the remaining three locks back into Skipton. Moored just short of the boatyard, as can be seen below. The captain allowed shore leave to explorer the delights of Skipton and to locate a possible oriental eating place and some real ale houses. A pint of Copper Dragon (Skipton brewed) was enjoyed sitting outside at The Royal Shepherd and the locals consulted regarding the best eating places. The Thai House restaurant was selected and large banquet was eagerly consumed. Afterwards the crew felt much bloated and decided to drink no further ale (except Jim) and elected to walk up the picturesque Springs Branch of the canal towards the castle. Found the boatyard owners own large new widebeam boat moored and spent some time talking to Pam and Ian (Owners) about the merits and costs of owning our own narrowboat. Met Jim later outside the "Narrowboat Inn" where a last ½ pint of ale was enjoyed, before returning to the boat. After Neil was despatched to purchase more milk, a healthy breakfast of Weetabix and toast was consumed before packing our things ready to hand the narrowboat back to its owners. Cast off at 8-55am to travel to last few hundreds of yards back to the boatyard where our belongings were transferred into Jim's car for the journey back to Wetherby. All agreed that this was another very enjoyable and educational canalboat adventure.